After baking this blueberry crostata I experimented using other fruits hoping to get the same heavenly results. 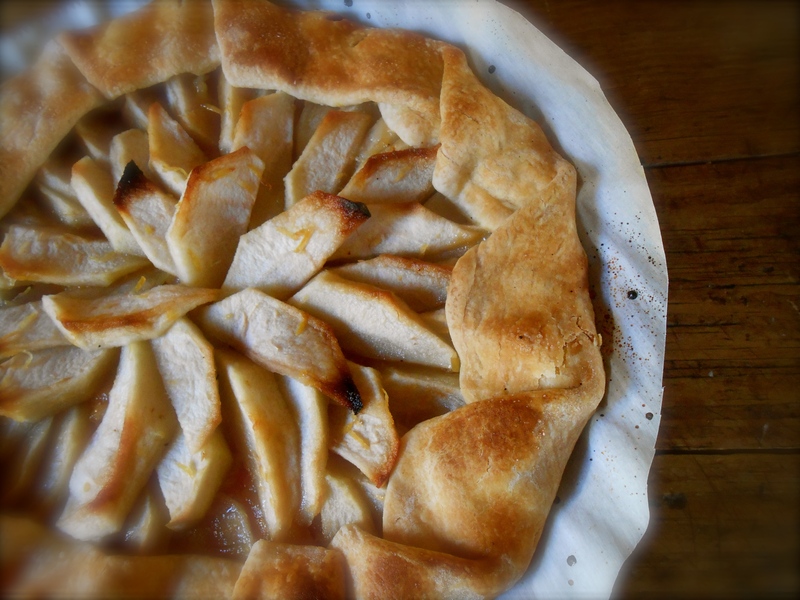 However, my efforts fell short when I tried to make an apple crostata; it turned out very dry and so did my enthusiasm. I gave up, until two weeks ago when I read this gorgeous post from The Rustic Plate and knew I had to try one more time to get it right. I really love making this type of “pie” considering it is both rustic and quite frankly…couldn’t be easier to put together. The galette was nicely moistened by the apricot preserves and baked without butter. Keep it on the lighter side or serve with vanilla ice cream, lightly sweetened softly whipped cream or a dollop of creme fraiche, either alone or stirred into whipped cream. Please visit Serena’s beautiful blog and see her wonderfully photographed steps in making this galette. Preheat oven to 450°F. Place the apple slices in a bowl with the sugar and lemon zest. Mix well and set aside. Roll out your pie dough and place on parchment paper lined baking tray. Cover the center of the round with ¼ cup of apricot preserves, leaving a 1 – 1 ½ inch border plain. 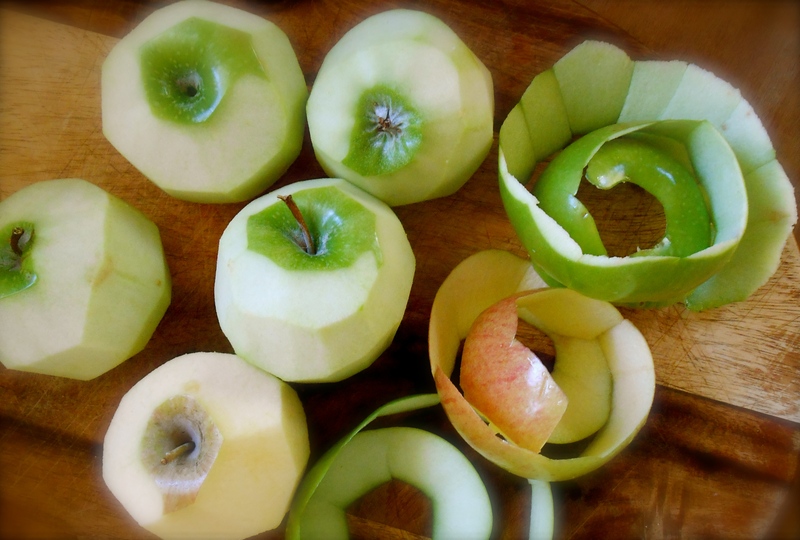 Starting from the outermost circle, begin to arrange the apple slices in a circular fashion, overlapping them slightly. Most likely you will create three overlapping circles of apple slices. Fold the crust over and around the edges to make a circle. Brush the crust with milk and give it a light sprinkling of sugar. Lower the oven temperature to 425°F. Place the galette into the oven and bake for 20 minutes. Reduce the temperature to 375°F and continue baking until the crust is nice and golden, approximately 30 minutes. This is one of my favorite desserts. Pretty easy to make and guests are very impressed. Your photo is lovely. Thank you Jovina. :) You are right, I made this for guests and they were very impressed. Didn’t last last long, should have made two! What a beautiful galette, looks delicious. Always one of my favorites, your photo is gorgeous! Thank you Suzanne. :) Hope you saw the Rustic Plate post too…that was a beautiful post! So inspiring. In an instant this became my favorite. I absolutely love apple pie! I did see Rustic Plate post also, it was wonderful, her galette was beautiful as is yours. I receive an email whenever you post. :-) Your blog is warm, effusive and just plain delicious. Best! Wouldn’t necessarily have thought of apricots and apples together. Recently, as apricots were half price I grabbed two punnets and stewed one of them. Very delicious. Huh, if I can get my act together I’d really like to try this. Awful probs re wisdom teeth again. And I seem to have a block with pastry right now. :) What am I saying, for the past five or so months! Hopefully you’ll get me on the right track. Oh no Johnny! Not your wisdom teeth again. :( So sorry to hear about this. Can’t think of any other pain so horrible than tooth problems. Bet some stewed apricots sound real good right now…nice and warm and soft. And I would have never thought to put apricots and apples together either. And this is the first apple pie I have made without butter and must say very happy with the results. Take care! lovely :-) You were persistent! Apricot preserves are wonderful in apple tarts. This one is a beauty! I agree. This is a first for me to use preserves with a tart and I get it! It created a nice barrier between the crust and the apples. Yes, it is wonderful. What a beautiful looking apple galette. So fresh and delicious. I love the photo too. Thanks so much for sharing! Fresh is a good description for this galette. I really like the texture the apples maintained without having a crust over the top. Less “steamed” and just a bit of crunch. We loved it. :) Thank you for your kind comment re: the photo. You’re on! :) Don’t you wish we could? Such a beautiful galette – that pastry looks to die for! Can’t wait for apple season to start here, to be able to make this. I immediately thought of your blueberry crostata (still in my Springpad “to make” list) when I saw this post. Looks beautiful! mmm w/ vanilla ice cream. You remembered it?! :) I’m starting to see blueberries in the markets now. I actually bought a bunch last week and they were so plump and sweet. Don’t get me started on the crostata again…I think I ended up make 3 or 4 of them before the season was over! Impressive. This is such a great dessert for this time of year. I bet it made the whole house smell cozy and delicious. Thank you…great description “rustic and warming”. I was so excited when I saw your post. I also tried with apples after trying the blueberry crostata. It is my favorite go to dessert when having guest over. I think I have thrown out a few apple experiments. I will definitely try this one soon. Thanks for not giving up. Miss you and congrats on the Super Bowl win. My daughter makes a similar apple galette but I don’t think she used apricot jam, Sending her your recipe so she can make it for me. :) Made me smile Norma. I love the thought and idea of making something for my mom… Apricot jam really gave this galette moisture and flavor. It is a wonderful recipe, a keeper for sure. Excellent looking dish. Very simple and tasty. lovely photos as always. Thank you Conor…a compliment from you regarding my photos is so flattering! Thanks again, Seana, for giving props to this fantastic, light, dreamy dessert! Thanks go to you for teaching me how to make apple galette! I really loved your post. It was photographed so beautifully. Honestly, I tried making an apple galette before and failed, and your directions and recipe turned out perfectly. We love it! This looks amazing, not to mention delicious! Thanks for sharing! You are currently reading apple galette at COTTAGE GROVE HOUSE.